I’ve decided to take my students on a fun-filled blogging journey for the last few weeks of school. In some ways I think I might be crazy trying to do this in such little time, but my guts are telling me to, “Just do it!” I’m glad I listened! 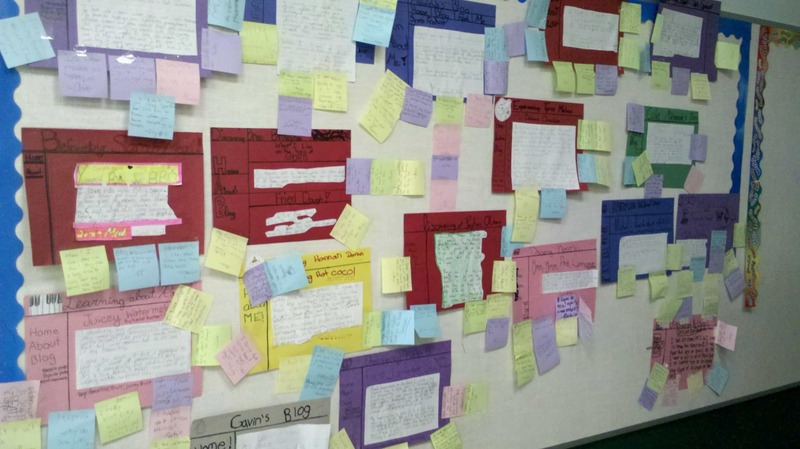 I decided to start as is suggested by some of my awesome PLN – with paper blogs. 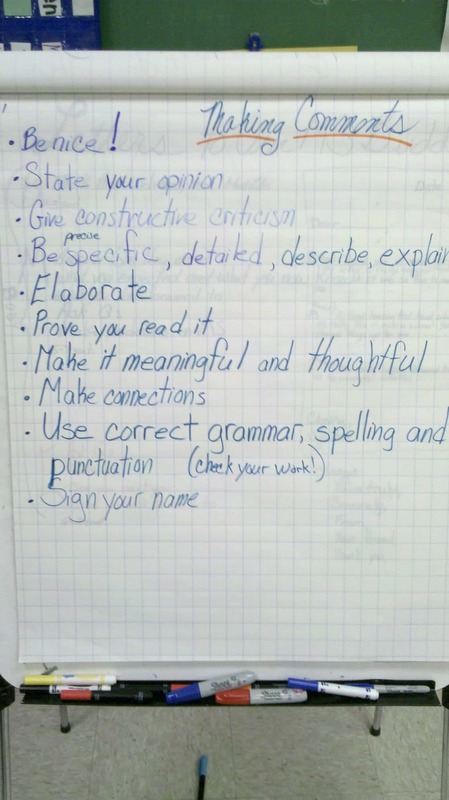 I took the lesson outline from Leonard Low and adapted it for my classroom. After going through this process, I really feel that introducing the concept to my fourth graders this way helped them to grasp the idea of what it means to create, interact with and maintain a blog. 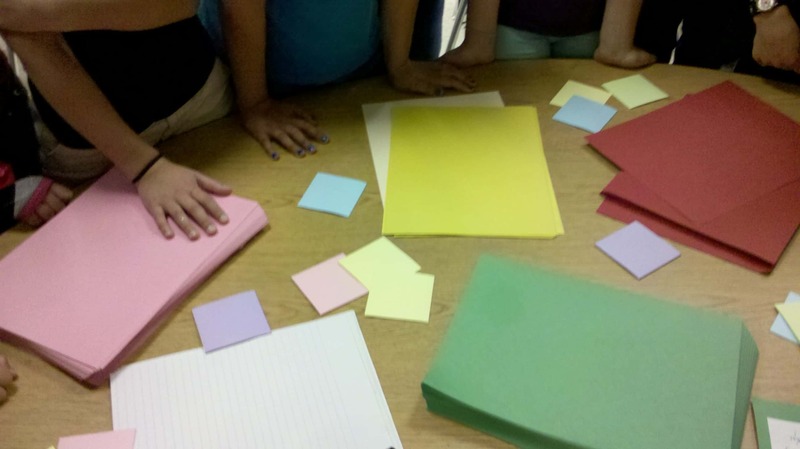 Introducing Vocabulary – First, I told the class about the blogging project and explained that we would start with paper and then move it online. (They were super excited.) We talked about where the word “blog” comes from. (It’s short for Web Log) Then I showed them my paper blog and we discussed the different parts of it: Blog Title (title of the entire web log), Post Title, Post (the article), Author Name, Date (of publication), Sidebar (on the left or right that contains links to other parts of the blog), Links (words or images you can click to go to another page on the blog), Tags (keywords that help to categorize a post), Icon (image that represents something), and Images (pictures). 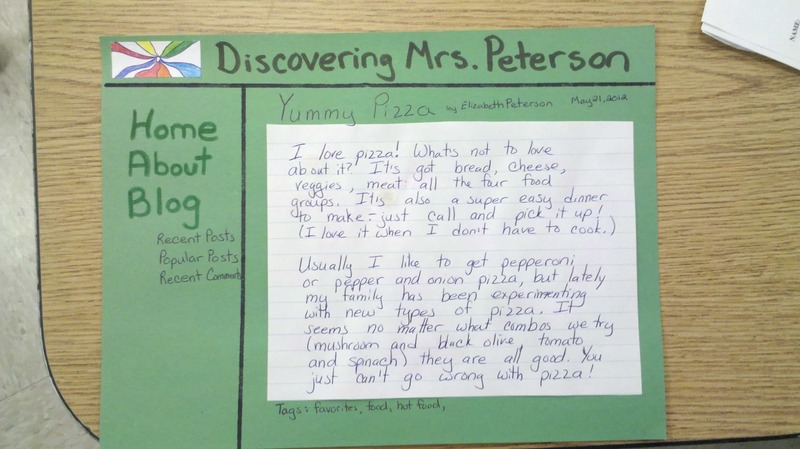 Get Students Writing – I then assigned a very easy and short writing assignment for the kids to do – write about their favorite food or drink. (This idea comes from the post cited above.) Students can then think about what tags they can use (favorites, food, drink, hot food, cold food, hot drink, cold food, etc.) The assignment only needs to be 1-3 paragraphs and show some knowledge of audience and purpose. The audience is the other students and the purpose is to casually share something you enjoy. We also talked about making your work publishable – it must be free from errors, neat and presentable. After all, the world could potentially see the work they do! Get Students Designing – Along with assigning the writing assignment, the students need to consider the design of their paper blog which needed all the pieces referred to earlier. I set aside plenty of materials to choose from: colored paper, markers, pens, pencils, etc. and let them loose. Get Students Publishing – I carved out a large chunk of time to work on this – about an hour and a half, so by the time we had to finish up for lunch a few students were ready to publish. When a student felt their paper blog was ready, they went over to our reading table at the side of the room and “posted” their work on the “internet.” Soon after lunch and recess, my students were done posting their work. Writing comments on blogs whether they are on paper or online, is a lesson in and of itself. 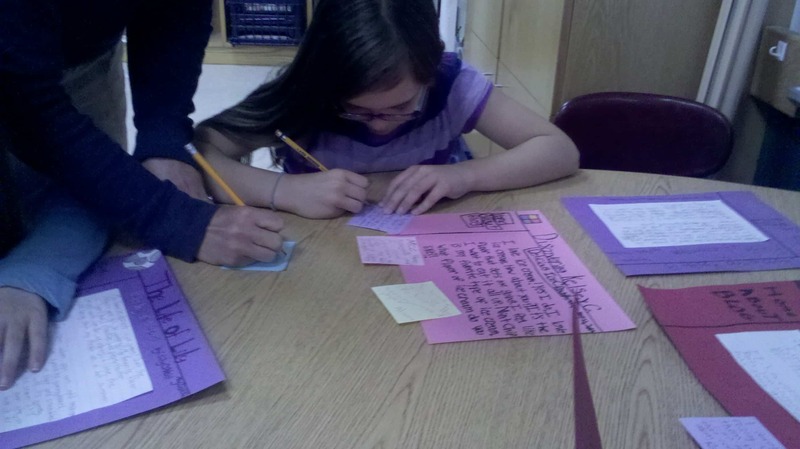 The goal is to have students write thoughtful, appropriate comments to one another that stay on topic. 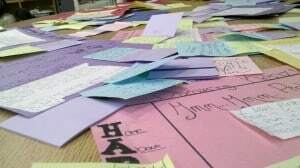 Because comments are so important to a blog, the students and I talked a lot about comments before going off to read posts and write some. Before the lesson, I had asked a couple of students to read another’s post and write a comment on a sticky to attach to the blog. When I got the class together, I read a student’s post to the class and the comment that was made. The comment was, “Great post!” I asked the students if they thought that was a good comment and they all smiled and nodded yes. I looked at them, smiled and shook my head. “Actually, it’s not a good comment because it really doesn’t say much.” Once I said that, my students agreed. I asked them to talk to their elbow buddies about what would make it a good comment and after a minute or two, we started to write down and discuss a brainstorm of what would make a good comment. Our list started with, “Be nice!” I emphasized this throughout our conversation. Being nice is the number one rule to follow whether you are agreeing, challenging or criticizing something someone said. You always want to be kind. Once we finished our list, I sent my students off to our physical internet full of posts (AKA the side reading table) and allowed them to bring posts back to their desks one at a time, read them, write a comment on a sticky note and return it to the table. This went on for a while. The kids loved checking back with their own posts and commenting back. The only last thing I said to the students was that I wanted every post to have at least 2-3 comments on it. Everyone was great during this whole experience. The students were positive, energized and were commenting on all kinds of posts (even ones from peers they normally don’t interact with). It was a great thing to witness! Once the comments were all done, I checked them all over and then posted them on the wall for all to see and read. It got them excited. I’ve never seen my students so motivated to do a writing assignment! 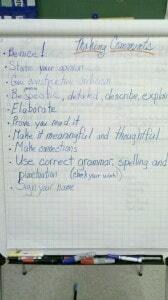 Putting this new spin (blogging) on and age old concept (writing) was like a magic formula for most of my kids. It got them prepared. Through the paper blogs, we were able to go over relevant vocabulary, and get some hands on experience with what blogging is and what it can do for us as learners before moving to the real gig. Where to go from here – Safety first! Going online is a big step and we need to make sure of many things: the principal and superintendent is on board, the parents give permission and the students are careful online. In my next post, I’ll discuss some of these things as well as how I introduced my students to their live blogs using Kidblog.org. Have you started blogging with your students? Please let how you started the process!